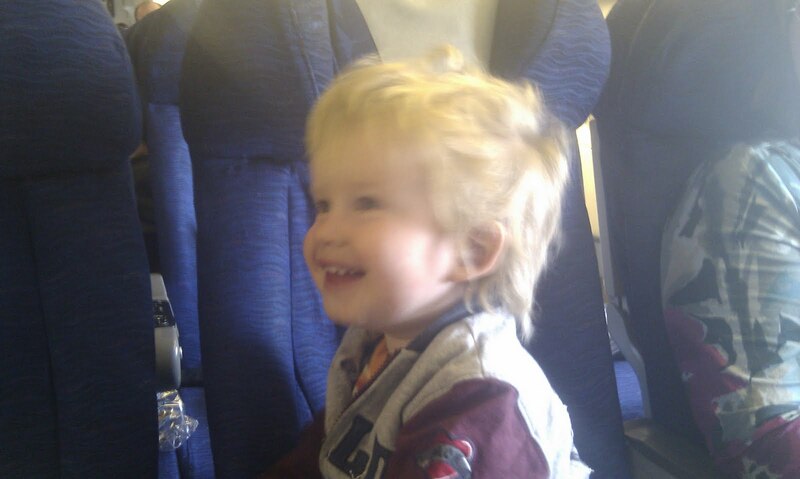 With our son nearing 2 years old, we knew that from that point he would have to pay a child's fare whenever we flew, but before then he would be eligable for an infant fare. Therefore we wanted to go on a last long-haul trip before this. We had thought Australia, but available annual leave, and finance (and the necessity to have the child on our laps!) we decided to go somewhere closer. Added to this, was the fact that I had sufficient Air Miles (www.airmiles.co.uk) earned from my last 5 years' shopping at Tesco, and petrol purchases from them, for a completely free flight as far as zone 5. By free, they do mean free - all taxes and fees are taken care of. Zone 5 is as far as the northeast USA, Moscow, North Africa and the Middle East to Dubai. As my wife has never been to the USA, but has always wanted to go to New York, we chose there as a destination. I booked both my ticket (free), baby Matthew's ticket (half the regular infant fare, half miles) and my wife's fare (cash) on the Air Miles website. Total cost was 5250 miles, plus £375, for the 3 of us. I also entered our BA Executive Club numbers, but the booking classes were too low for any BA miles at all. We then found that hotels in Manhattan are ridiculously expensive, so we decided on a rental apartment in Brooklyn, both for space per $, convenience, and having a more quiet area to stay in. We also booked a night at the Heathrow Central Travelodge the night before, as we needed to be at the airport at 8am the next day, and we live 2.5 - 3.5 hours away depending on traffic. We also arranged to leave our car at my brother in law's flat, in Earlsfield. Our day of departure (from the house) arrived, and we spent some time packing cases and loading the car. We had wanted to leave after lunch, when Matthew would be having his afternoon sleep, but we ended up not leaving until 4pm. We picked up my brother in law from Hounslow West tube station, and proceeded to Nandos in Feltham for food, especially late in Matthew's case! Then on to the hotel to unload, and put the boy to bed. Unfortunately they had no baby cots (despite them telling me on a previous visit not to bother booking one, they always have plenty) so we set up the spare mattress on the floor for him. He eventually slept on the floor itself on a duvet, between the bed and the mentioned matress! I took Blake (the brother in law) home and left the car there, and came back by train and bus, and we had a good night's sleep. We were woken at 6 by an alarm, as we wanted to catch a bus to the terminals just before 7 (we spashed out on the Hotel Hoppa bus, so we wouldn't have to carry our cases to the local bus stop, and irritate regular passengers with them). Outside, Matthew looked in awe at the heavies landing almost directly above us on 27R - he looked frightened for the first one, but then loved it, saying each time "Big plane! 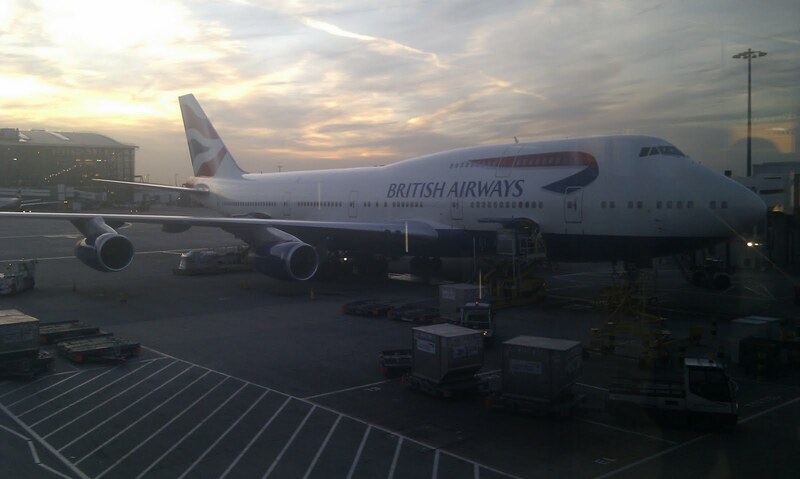 Big plane!" Unfortunately we just missed the desired bus (H7) and were resigned to wait there for another 30 minutes, but 10 mins later another arrived, that went directly to T4 and T5 (H54), that was not advertised on the posters! This would save us the shuttle train to T5 so we boarded it, and the driver was happy to accept our ticket to T5 (our ticket was to T3). On arrival at T5, we tried to use the kiosk to check in (I'd tried to use mobile checkin but it failed), but this failed so we had to queue at a manual desk. 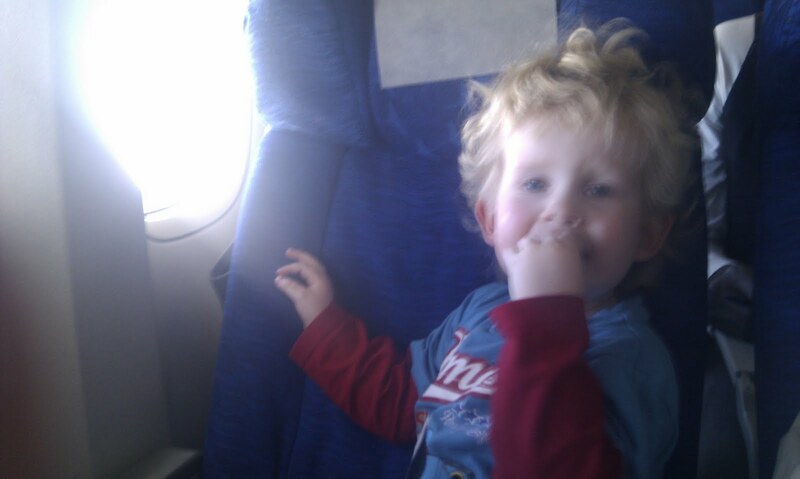 This appeared to be because we had an infant with us, so we had been allocated a bulkhead seat with a little extra room. We left our luggage there, and proceeded through security. After buying some food in Boots, we took the shuttle train to T5B, to wait for the flight. We were approached by a gate agent, along with another family with a small child, and an elderly lady in a wheelchair, to be pre-boarded. My wife was "chosen randomly" for extra security screening, so she went downstairs towards t he gate with the agent, whilst I waited for the lift with Matthew's pushchair. It arrived, we descended, and met my wife who's screening had already passed. Can't have been more than 30 seconds! We then proceeded down the jetway to the aircraft, picking up a newspaper on the way. which I was p leasantly surprised by. At one point turbulence became quite bad, my wife was sick (which lasted a few days into the holiday, when combined with morning sickness which she was free of for the week before we left). Matthew sat on my lap and watched some TV on the miniature screen, Cbeebies, the BBC channel for toddlers. He reacted angrily though to the headphones to hear what the TV characters were saying, but he seemed happy to watch in silence! We kept ourselves hydrated, and especially Matthew, so we took his empty Fruit Shoot bottle to the galley and filled it with a mix of apple juice and water. 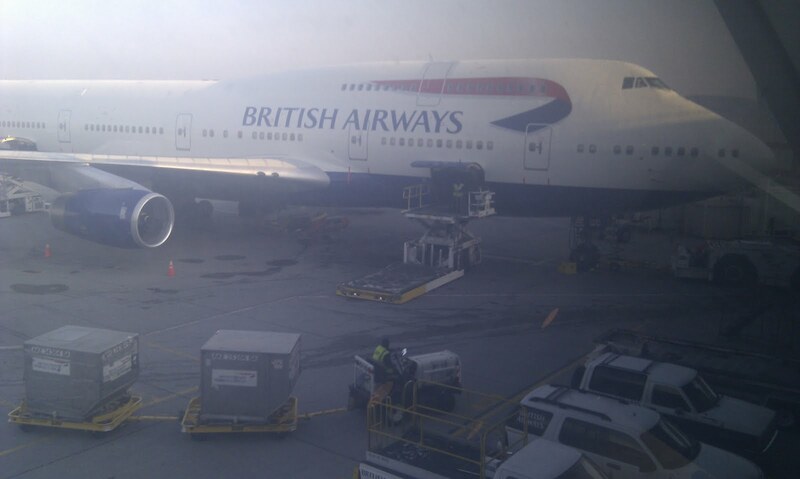 I had a chat with the steward whilst there, with him saying New York is one of his favourite destinations. Soon after, the pre-arrival snack was brought around. My wife's arrived first (as usual) and consisted of a gf-roll and a bowl of fruit salad. Mine came, and was a sandwich and mini KitKat bar. This too was very tasty. It has to be said, that no infant food was provided, not that we expected any (the only airline to provide infant food was SAA, which provided two jars of baby food and a carton of fruit juice). By now we were descending, so back on my lap for Matthew. 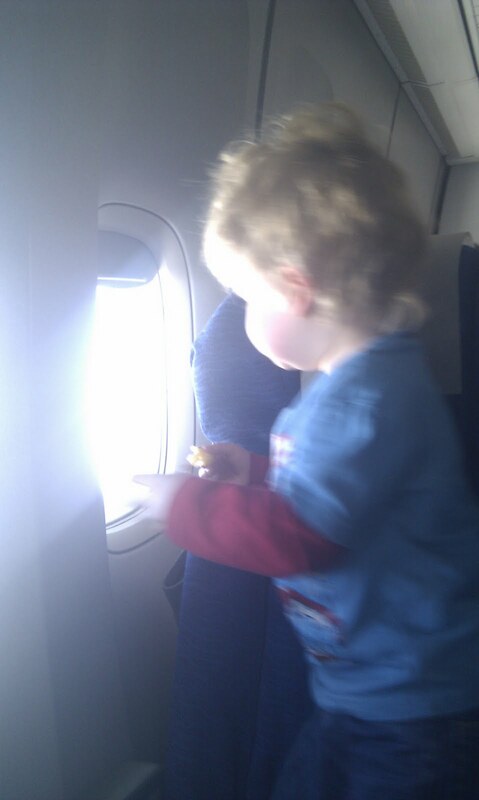 As well as looking out of the window of the views of Long Island, he played with the plastic suitcase from earlier, and a sheet of animal stickers, which we stuck on the case. 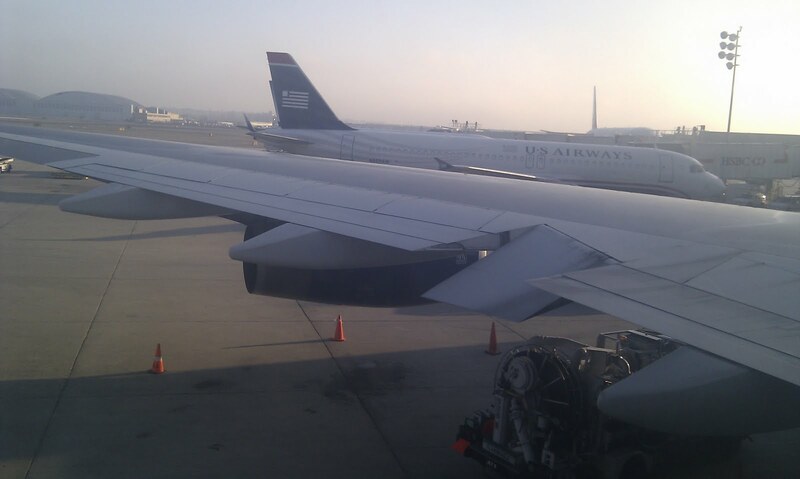 We landed smoothly on 31R, and the taxi to Terminal 7 was very quick. After a great week in New York, it was time to come home. The owner of the apartment gave us the phone number of a taxi firm, so we booked a taxi for the following morning at 5am, in time for our flight at 8. We checked in at a kisok, no problem this time! Again we didn't spend $5 on a luggage trolley to move our bags less than 50m from the kerbside, to checkin kiosk, to luggage drop. Matthew was very tired, and starting to get antsy, so when we went through the security checkpoint (my first and so far only experience of the infamous "TSA"), he started moaning. We passed through ok, but my wife had to explain the baby foods and bottles, and despite carrying a crying baby we were not allowed to give him his milk until the agent had checked all the bottles (annoying as he had already checked the milk!) Anyway, once they were all checked and cleared, we gave Matthew the milk and he was happy. It was only 6am by this time, 2h to departure, so we went to find some breakfast. Not many of the open cafes had anything gluten free (for my wife), not least Starbucks, as their UK operation has at least 2 GF cakes, and some other snacks, whereas here nothing, and nothing on the labels saying their allergens (but they did say the exact number of calories per cake!) So, McDonalds got our business, for my wife a bacon and egg sandwich minus the bread, the same for me with. Their hash browns are ok. We fed Matthew with some cereal with made up formula milk. My wife went to the duty free shop to buy some perfume, and was surprised when they didn't give it to her but said they would deliver it to the gate. They did so, so she was relieved. 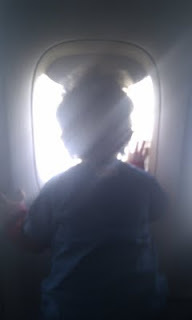 We, along with the other few parents, were called forward first to board, and we went down the jetway to the aircraft. After asking to confirm if we would get the pushchair back on exiting the aircraft or on the baggage carousel, we were told we could take in on and use an overhead locker - as the flight was far from full there would be room. This eastbound daytime flight was clearly not the busiest for BA! 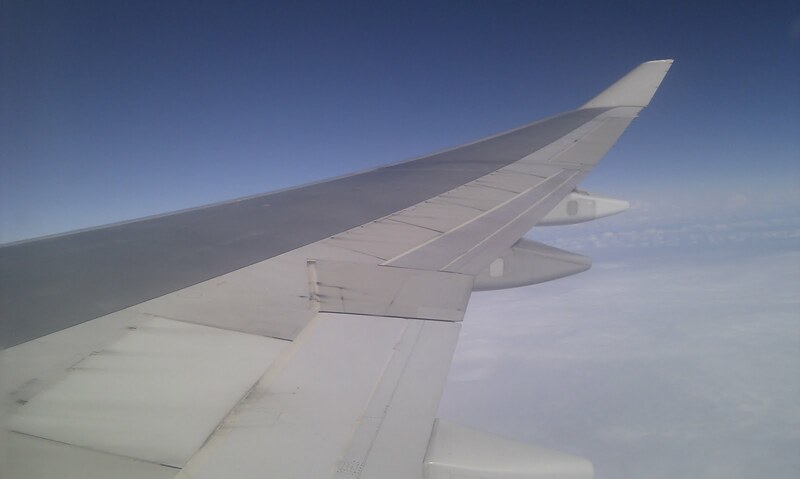 Again we had a window side bulkhead seat, with an older Yorkshire gentleman next to us. 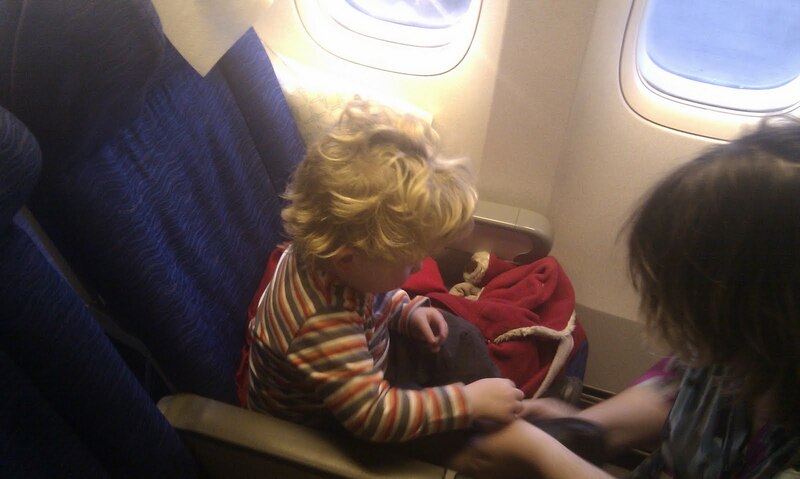 The checkin agent had said there were 60 spare seats on board, so we offered him the chance to move, but he was happy - there was a little extra legroom, and he had grandchildren so wasn't worried about Matthew. 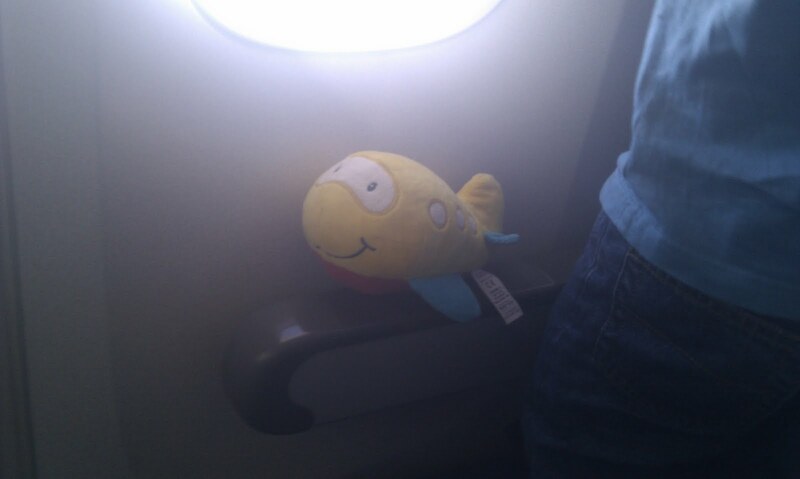 He was travelling with another 4 guys (including his son) who were in the middle section accross the aisle. 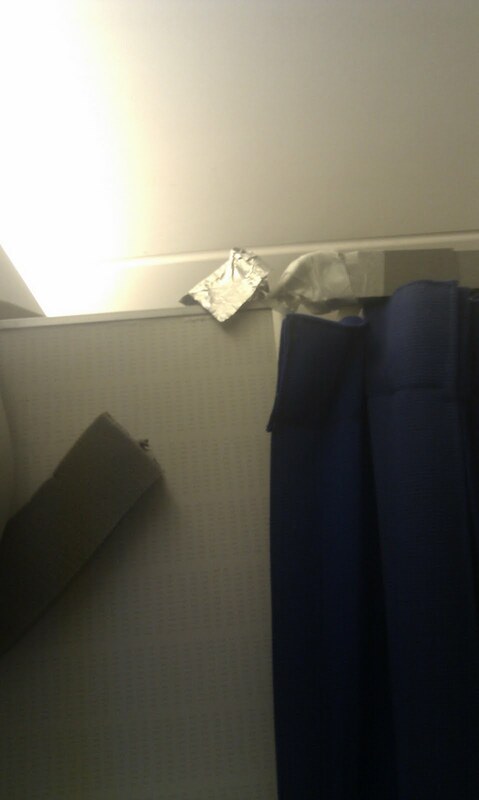 I did notice that the bulkhead curtain rail was stuck together with gaffer tape - not exactly a good impression! 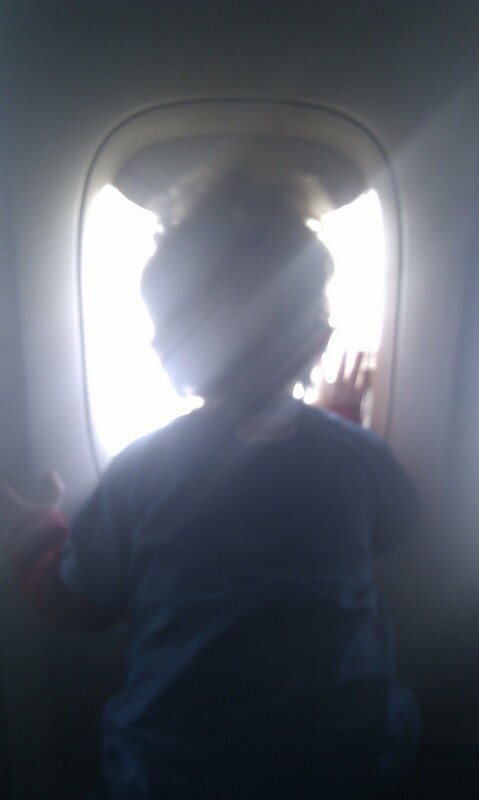 There was no child gift this time, but we buckled up and got ready to depart. There was a long taxi to runway 04L, where we took off. 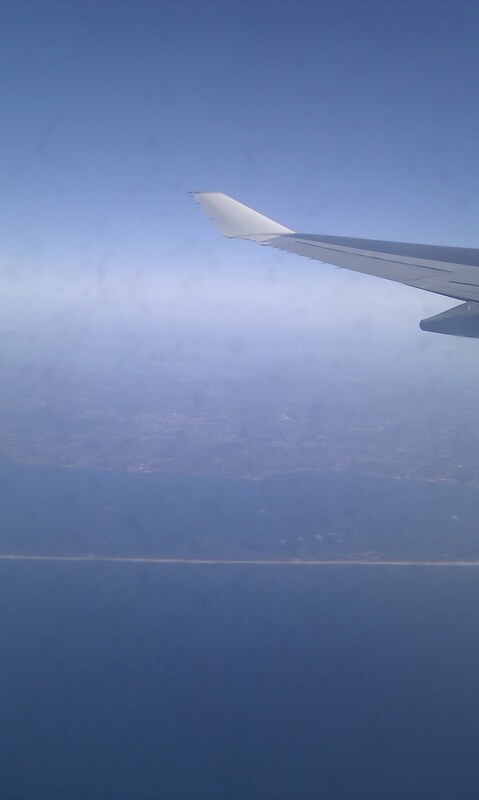 We followed the coast of Long Island, where we got some nice shots of Fire Island except the dirty windows smudged them somewhat. After spotting Nantucket, we headed out to sea. I forget what my wife's meal was, but I was offered omlette or vege lasagne - I took the lasagne as I'd already eaten breakfast. It was surprisingly good! Although there was more turbulance - enough to make the drinks spill from the table, my wife didn't feel sick this time. After an hour or two, Matthew started getting overtired, and he cried for 5 minutes until he finally fell asleep on my wife's lap, where he stayed comatose for 3 hours. He woke shortly before the pre-landing snack was distributed - my wife had another fruit salad, and a muffin for the rest of us. Matthew continued to play, and we landed on 09L on time. 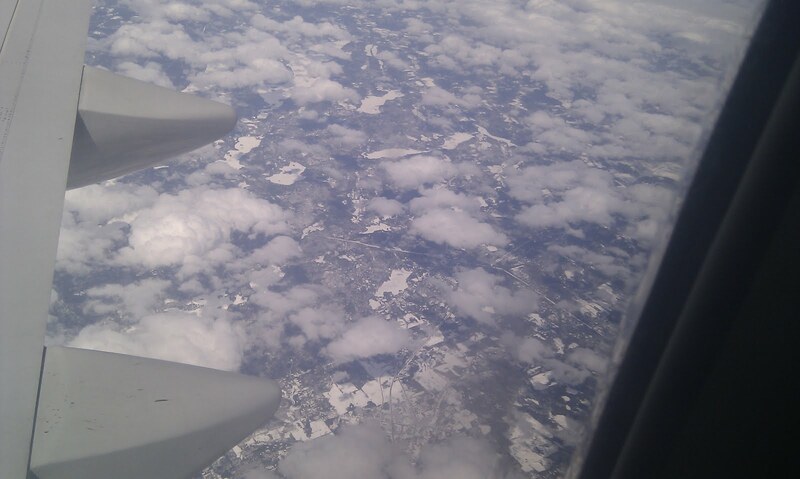 Overall a good flight, once we left the US coastal turbulance. We deboarded the aircraft and made our way to the little train shuttle to the main hall of T5, passed immigration without a problem and picked up our bags. I left my wife with the luggage (on a trolley!) to sit in a cafe whilst I took Matthew to the bus stops to catch a bus to Feltham, the train to Earlsfield back to my brother in law's to pick up the car - he was in Paris himself, running his first marathon. We returned to T5, picked up my wife and drove home, getting in at 2am, but this was only 9pm on our body clocks. A good holiday, a first time change for Matthew who has taken about 4 days to get back into his normal routine, and my wife enjoyed her time in New York. How did you rent the apartment? Sorry to hear about your wife. Next time travel with medication. I don't like BA legroom; too tight at 31." Food though is always good. Will will travel with medication, she had some tablets but as she is pregnant with child number 2 our doctor advised limiting her intake to half the normal dose. 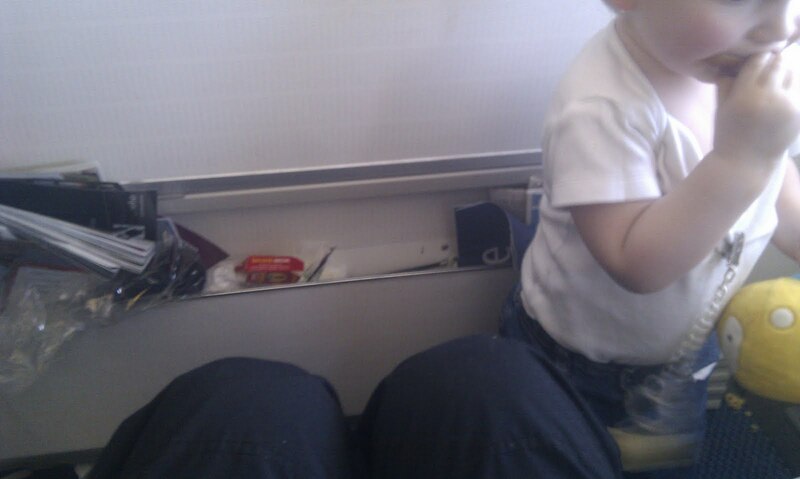 I've edited the main post to include a photo of the legroom - for Y it is good at the bulkhead! Kids growing up that fast, definitely.